Arguably the most prestigious event in winter sports is the Winter Olympic Games. From the initial bidding, building the competitive venues, constructing an Olympic village, hosting the world’s top winter athletes and the media circus that goes with them - and somehow creating a lasting legacy to justify all the tax dollars spent on infrastructure - it is a mammoth task. The Sochi 2014 Games cost a reported $51 billion. But was this huge investment worth it? Certainly many winter tourism destinations think so and the ski resort area of PyeongChang, South Korea was more than willing to take the risk. It made three attempts to bid successfully for the Winter Olympics, finally nabbing the elite event for 2018. It was all part of its aim to put South Korea’s premier winter sports area firmly on the international ski map and challenge Japan for predominance in Asia. The indoor ice events were planned for Gangneung, a northeastern coastal city with a population of around 230,000. But the international spotlight was directed to the less densely populated county of PyeongChang chosen for the mountain venues as well as the opening and closing ceremonies. The long-term legacy for PyeongChang is hoped to be a commercially viable, international ski center with new venues for training and competitive freestyle skiing and snowboarding events in the future. Rather than compete with Sochi’s extravagant facilities and expenditure, PyeongChang aimed to use many existing venues and create a lower key but more authentic atmosphere reminiscent of the 1994 Lillehammer Winter Olympics. Lillehammer’s ski resorts are spread over five alpine centers:, Skeikampen, Kvitfjell, Gålå and Sjusjøen. Incidentally, although Lillehammer may not have indulged in the huge financial outlay of Vancouver or Sochi, it is now the location for the award-winning TV drama series, Lilyhammer, starring Steven Van Zandt, which has given lasting marketing and advertising ROI to the quaint Norwegian mountain town. The Lillehammer Olympic ski jump was immortalized in one of the most iconic episodes. Having worked on the 2010 Vancouver Olympics and the 2014 Sochi Winter Olympics), Paul Mathews’ company, Ecosign was chosen to plan the Freestyle Skiing and Snowboarding venues for PyeongChang. Ecosign had already designed various ski resorts in South Korea including Konjiam Resort, Hyundai Sungwoo Resort at Tunnae Village and Yeongpyong Resort. 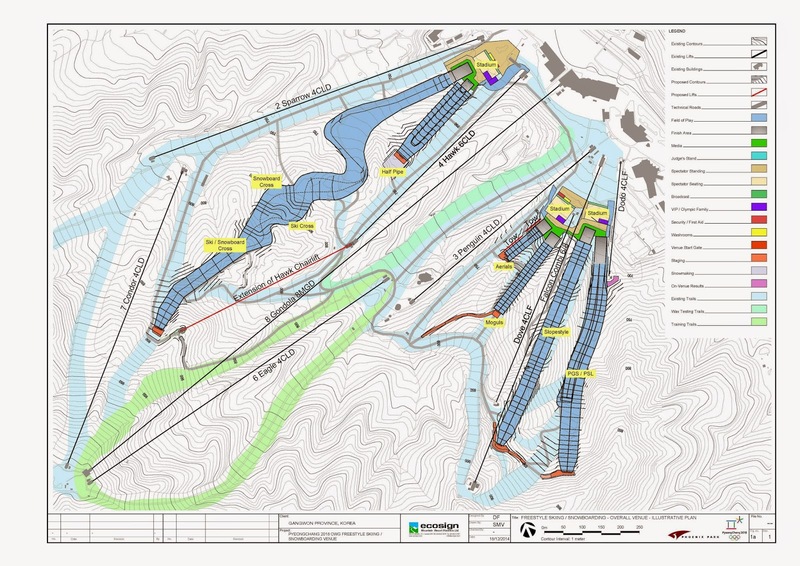 “The job we are doing for POCOG, the Organizing Committee for the PyeongChang 2018 Olympic Winter Games has been to prepare an overall Venue Master Plan for Bokwang Phoenix Park Ski Area for Freestyle Skiing and Snowboarding,” says Mathews. The master plan, formulated in 2013, also entailed detailed designs for construction. The process of creating any Olympic venue is typically fraught with unexpected problems. In the case of PyeongChang, the original bid was based on fielding 12 Freestyle Ski and Snowboard sections. “In the summer of 2011, the IOC added eight competitions to Freestyle Skiing and Snowboarding so that the total for Sochi and PyeongChang was now 20 competitions; 10 for men and 10 for women,” says Mathews, adding that the Korean budget had not allocated funds or terrain for these extra events.